NEW CREATIVE RECREATIONS IN NOW !!! New Creative Recreations are in now !!! Stop in today and get a pair before they sell out !!!! APRIL 20TH HOLIDAZE SALE RECAP! DJ OMAR-ABDUL BROUGHT OUT THE CLASSICS ! DJ HANK D TORE IT DOWN !!! THE SHOPPERS ENJOYING THE MUSIC AND THE SALE ! EVEN THOUGH IT WAS A RAINY 420 THAT DIDN'T STOP TIMEBOMB! A LOT OF CUSTOMERS NEW AND OLD CAME THRU TO GET THE LASTEST SPRING AND SUMMER GEAR FOR 20% OFF. DJ OMAR-ABDUL BROUGHT OUT THE OLD 45'S AND DJ HANK D TOOK US BACK ON ALL HOT 420 JAMS. BZE KICKED HIS FREESTYLES AND EVEN HAD A SPECIAL RUDE BOY FROM JAMAICA GRAB THE MIC AND KILLED IT! ALL TOGETHER IT WAS A GREAT DAY- HOPE ALLOF YOU HAD A HAPPY 420. WE'LL KEEP YOU ALL POSTED FOR OUR NEXT EVENT, SO KEEP AN EAR TO THE STREETS! BIG SHOUTS TO BOAZ . CHECK OUT THE REVIEW THAT XXLMAG.COM GAVE ON THE AUDIO BIOGRAPHY . STEEL CITY STAND UP . BOAZ IS THE VOICE THAT KEEPS REAL HIPHOP MUSIC ALIVE . CROWD CONTROL- THE PLACE WAS PACKED! LADIES STOP THRU TIMEBOMB FOR THE HOTTEST AND MOST EXCLUSIVE CLOTHING OUT! HANK D AND BROOKE HOLDIN IT DOWN! DIPLO CAME THRU AND WRECKED IT! WE HAD A GREAT TIME AND THANKS TO OUR LADIES WHO CAME OUT! 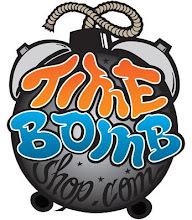 STOP THRU TIMEBOMB TO GET YOUR LIVES RIGHT AND STAY IN THE KNOW FOR THE BEST EVENTS IN THE BURGH! APRIL 15TH THE 2ND ANNUAL KICKSBURGH EVENT HELD AT CARNEGIE MELLON UNIVERSITY. BRICK DIGGLER HOLDING THE TABLE DOWN. KATIE SETTING UP THE TIMEBOMB BOOTH . SOUL2SOLE KILLING THE PITTSBURGH FITTED GAME THE CHINESE COLLECTION (SICK) THERE WAS A LIVE DEEJAY ROCKING THE CROWD. MANY VENDORS AND TONS OF SNEAKER FREAKS! B-BOY BATTLE THE 2ND ANNUAL KICKSBURGH EVENT WENT DOWN ON TAX DAY- APRIL 15TH AT CARNEGIE MELLON UNIVERSITY. WE WERE HAPPY TO BE INVOLVED WITH THIS EVENT AGAIN THIS YEAR. I HAD THE CHANCE TO SPEAK AT ONE OF THE SNEAKEROLOGY 101 CLASSES AT CMU ABOUT RETAIL AND IT WAS GREAT TO SEE YOUNG PEOPLE INTO SNEAKERS AND FASHION. THE KIDS EVEN GOT REEBOK TO DROP THEM A LIMITED SNEAKER PACK THAT CAME WITH AN OPITIONAL OLDSCHOOL LUNCH BOX. THERE WAS ONLY 101 MADE AND THERE WAS A HUGE LINE TO BUY THEM BEFORE THE EVENT EVEN STARTED. THE EVENT WENT ALL EVENING AND THERE WAS EVEN A ILL B-BOY BATTLE. TIMEBOMB SPOT WAS HAPPY TO REPRESENT AT KICKSBURGH 2009. SEE YOU NEXT YEAR ! 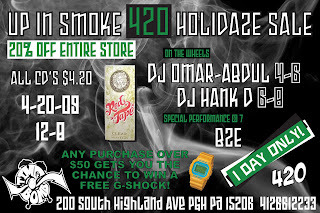 UP IN SMOKE 420 HOLIDAZE SALE !!!!! ITS THAT TIME OF THE YEAR AGAIN! MAKE YOUR APRIL 20TH COMPLETE WITH A STOP DOWN THRU TIMEBOMB. LIVE MUSIC IN STORE 4-8 WITH DJ HANK D AND DJ OMAR-ABDUL WE ARE HAVING A 20% OFF EVERYTHING IN THE STORE. IF YOU BUY SOMETHING AND SPEND OVER $50 YOU'LL BE PUT IN A RAFFLE FOR A FREE G-SHOCK WATCH. WE'RE ALSO SELLING OUR CD'S FOR $4.20. THIS IS A ONE DAY ONLY SALE SO DON'T MISS OUT!! CAVI IS BACK! AS ALWAYS AND EXPECTED THEY'VE HIT US WITH SOME OF THE MOST STYLISH PIECES OF THE SEASON. WHETHER YOUR DIG IS THE MILITARY STYLE OR THE CLEAN CUT POLO, CAVI HAS GOT IT FOR YOU! THE LIGHT BLUE/ORANGE MILITARY REMINDS UP THAT IT IS ABOUT TO BE SUMMER TIME! PERFECT FOR THAT TRIP TO BEACH THIS YEAR! IT'S NEVER TOO LATE TO GET YOUR LIFE RIGHT-BUT STOP THRU SOON BEFORE THESE BRAND NEW STYLES ARE GONE! NEW 10 DEEP COLLECTIONS IN NOW ! UP AT TUFF CITY STYLES IN THE BRONX ! BOAZ SHOW UP IN NEW YORK !! !